1. The Asian Legal Resource Centre (ALRC) would like to draw the attention of the UN Human Rights Council to the deteriorating state of freedom of expression in Pakistan. In states like Pakistan, where democracy is little more than fascism behind a façade of democracy, free press is the first casualty. The Constitution and certain legislations authorize the government to curb freedom of speech on subjects that include the Constitution itself, the Armed Forces, the Judiciary, and religion. Harsh blasphemy laws have occasionally been used to suppress the media as well. 2. Pakistan has been ranked the fourth most dangerous country in the world for journalists, with a total of 115 killings since 1990, according to a report issued by International Federation of Journalists (IFJ). According to the Report, journalists in Pakistan experience official attempts to restrict critical reporting, as well as high levels of violence from both State and non-State actors. The Annual Report by Freedom Network, titled, Growing Sounds of Silence – The Year of Censorship, states that in the year 2014, 14 journalists were killed in Pakistan. But, it is the year 2015 that proved to be the year of gags on free speech, and 2016 has continued the trend. Since 2015, journalists and media houses have faced a silent but potent crackdown on dissent and freedom of expression not seen before under civilian rule. Pakistan is rated “Not Free” in the Freedom of the Press Index 2016, and is ranked 147th out of 195 countries and territories worldwide. 3. Much like 2015, in 2016 too, the State has continued to push for draconian laws to curb free speech and muzzle press and media. In 2015 it was the Pakistan Electronic Crime Bill (2015) to curb freedom of expression over the Internet and social media. On 29 October 2015, Members of the National Assembly’s Standing Committee on Information and Broadcasting proposed amendments to the Pakistan Electronic Media Regulatory Authority (PEMRA) law. If passed, the Act would outlaw the broadcasting of any language that is counter to the “ideology” of Pakistan or the sovereignty or security of the State; incites violence or hatred; or defames or ridicules the head of State, armed forces, or the Executive, Legislative or Judicial branches of the State. 4. The State and the powerful establishment, in connivance with non-State actors, have shrunk space for free press. 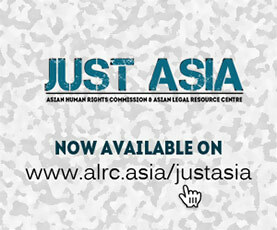 The Asian Human Rights Commission (AHRC), sister organization to the ALRC has been documenting several cases of denial of the right to free speech by the establishment. In 2015 AHRC issued an urgent appeal case 032-2015 on the military’s intervention in academic discourse on the subject of Balochistan. A talk scheduled at the Lahore University of Management Science on Balochistan was cancelled on the written orders of Lieutenant-General Rizwan Akhter, Director General of Pakistan’s intelligence agency, the ISI. Two prominent human rights defenders, Mama Qadeer, President of the Voice of Baloch Missing Persons (VBMP), and Ms. Farzana Majeed, General Secretary of the same organization, were scheduled to speak on missing persons in the Balochistan Province. A few days later when the same seminar was held at T2F, a popular meeting place in Karachi, the owner Sabeen Mahmood, a prominent social activist, was shot dead by an unknown assailant. The AHRC documented her case in UAC 052-2015 drawing the attention of the international community to the extent of the state atrocities to curb free speech. 5. The impunity enjoyed by those who attack journalists is seriously hampering press freedom in Pakistan. According a Reporters Without Borders report, the role of non-state groups — often militants such as the Islamic State group (ISIS) — is rising, in terms of perpetrating attacks against journalists. In January 2016 alone, two journalists lost their lives at the hands of unknown assailants. The office of a TV channel was also attacked with explosives in the same month, on 13 January 2016, and ISIS claimed responsibility. Incidents of threats, attacks, and killings of journalists in Pakistan are clear evidence of how critical the situation has become due to a thriving culture of impunity. Pressure and intimidation has forced journalists in Pakistan to adopt self-censorship, particularly in conflict areas. 6. The National Action plan (NAP), a counter insurgency plan by the civil military alliance that was conceived following the Peshawar Army Public School massacre, also puts curbs on free speech, though it originally meant to reduce space for hate speech; many journalists especially from Balochistan Province have found themselves threatened into silence for speaking against Baloch ethnic cleansing. 7. The youth of Pakistan is fed on a retrogressive State narrative; critical thinking is discouraged and limited; resultantly Pakistani youth are easily radicalized and prone to violence against dissenters. 8. In 2010, via the 18th Amendment, the right to information was inserted in the Constitution; the provinces were given the power to legislate on the right. Khyber Paktunkhuwa Province has so far been the only province that has enacted an effective law. In all other provinces, the enacted laws have been eyewash; they are weak on many fronts, exempting major institutions like the Army, Judiciary, and other key State departments. The resultant curb on access to information has affected the right to free press, as journalists cannot gain access to State files; it has jeopardized transparency. The increasing intolerance towards criticism and unearthing of State corruption has made it difficult for journalists to exercise their right to freedom of press and access to information. 9. It is lamentable that though Pakistani media looks free, in reality it is under attack from all sides. Journalists have to risk their lives doing their ordinary work. The growing intolerance within the society has made reporting of truth a culpable exercise. No State institution, be it the Judiciary or the Executive, tolerates criticism – a sign of immature institutions. Many journalists are facing treason charges and lower courts have issued arrest warrants without hearing them. a. Ensure freedom of press and protection of journalists; strong democracy needs transparency and transparency is not possible without a free media. A free press supports the cause of democracy and ensures good governance through transparency. b. Enforce the recommendations made by the Special Working Group of Pakistan Coalition on Media Safety (PCOMS) to investigate attacks against media practitioners in Pakistan, including appointment of a special prosecutor on journalists’ safety, legal aid unit for journalists in distress, counseling unit for families of journalists killed, and a primary case investigation unit to actively pursue cases of attacks against journalists and media. c. Make arrangements in all major cities to provide refuge and safe houses for journalists who are forced to leave their homes, so they can live and work in safer cities.